the website of award-winning social enterprise Timeless Music Project. An independent musician-led project promoting the Yorkshire music industry at international events 2006 to 2011. Identifying a painful lack of real support for the sector, Huddersfield based Social Enterprise Timeless Music Project fought hard to secure many important opportunities including the first ever "all Yorkshire" showcases at at SXSW Music Conference, USA even becoming a key partner in the British Music Partnership. Organised by local singer Pat Fulgoni, the project assisted a large number of artists and labels from the region many of whom have gone on to achieving big things. With no core funding and not being a RFO (regularly funded organisation) meant that TMP had to partner with different groups, funders and organisations every year so it was quite miraculous this project kept going however the results were pretty impressive. See feedback page. It is hoped that this initiative will one day be built on to further support Yorkshire’s talented music industry sector. If not, why not? The sector certainly deserves it. For more information click the "about us" and "feedback" sections above. We still believe in the value of music and that local musicians and the music industry deserve better. There is so much good music in Yorkshire 2016. If you would like to sponsor this initiative please don't hesitate to contact us. Just to clarify this year we cannot provide a Yorkshire Showcase, CD or further SXSW support. Its been a pleasure delivering showcases for the region's talented music industry over in the USA in 2009, 2010, 2011 and we've had 6 years of Yorkshire CDs out there but despite some great outcomes (see "feedback" section) and trying our very best, for this year we have suddenly been knocked back on our arts funding applications and we have been unable to secure the necessary regional partnerships / support for our project. This means we do not have the necessary funds we need to buy into the British Music Embassy venue etc. So its a year off I'm afraid! That said, our third SXSW briefing (for the British Music Partnership) was once more rammed with 200 delegates at Hifi Club Leeds. We have been told this is 4 times as many delegates as any other UK regions taking part. It clearly illustrates the demand and its great to see so many Yorkshire acts and music businesses going out to SXSW 2012. Its a bumper year. We should claim ED SHEERAN too as he's originally from Halifax and we've also just learnt that two local singer songwriters Jasmine Kennedy and Emily Sargent are now off to Texas too! DEADLINE FOR SXSW SHOWCASE APPLICATIONS IS NOVEMBER 4TH! SXSW AND MIDEM BRIEFING EVENT COMING TO YORKSHIRE! Thursday 1st September 2011. 6.00 pm. HIFI CLUB, 2 Central Road, Leeds, West Yorkshire, LS1 6DE. GUEST SPEAKERS include Una Johnston (SXSW), Javier Lopez (MIDEM), Pip McEvoy (UKT&I), Phil Patterson (UKT&I Music Industry Specialist), Kelly Wood (Musicians Union), James Farrelly (AIM), Julian Wall (BPI), Pat Fulgoni (Timeless Music Project) and more. Want to showcase at SXSW (USA) or MIDEM (FRANCE) in 2012? Hoping to attend SXSW (film, interactive and / or music) or MIDEM 2012? DEADLINE FOR SXSW SHOWCASE APPLICATIONS IS NOVEMBER 5TH! 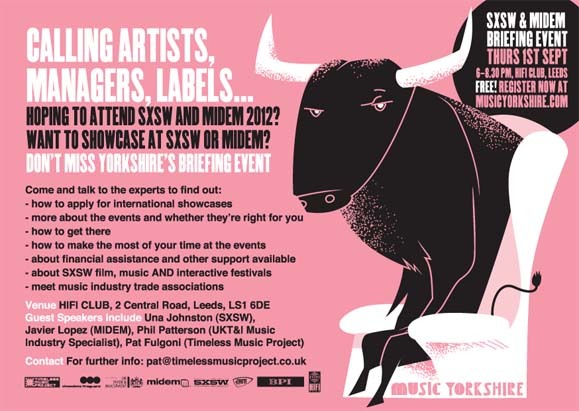 SXSW AND MIDEM BRIEFING EVENT COMING TO YORKSHIRE! Wednesday 1st September 2010. 7.00 pm. Brudenell Social Club, 33 Queen's Rd, Headingley, Leeds, LS6 1NY. + MIDDLEMAN and Serious Sam Barrett (live) from 10 pm + Poster Art Exhibition! Want to showcase at SXSW and / or MIDEM 2011? Hoping to attend SXSW (film, interactive and / or music) or MIDEM 2011? - how to apply for a showcase - more about the events and whether it is right for you - how to get there - how to make the most of your time at the events - find out about financial assistance and other support available. British Music Embassy, Latitude 30, 512 San Jacinto, Austin, Texas. Register at www.britishguestlist.info. Badgeholders will be prioritised. NEWS ABOUT YORKSHIRE @ SXSW 2010 COMING SOON! If you are an act from Yorkshire and you are playing this year's SXSW make sure you register your interest in a slot on the annual SXSW Yorkshire CD. Contact us about that asap. DEADLINE FOR SXSW SHOWCASE APPLICATIONS IS NOVEMBER 6TH! CALLING ALL ARTISTS, MANAGERS, LABELS. THINKING OF SHOWCASING AT SXSW 2010? SPECIAL ONE OFF SXSW BRIEFING EVENT COMING TO YORKSHIRE! Tuesday 15th September 09. 6.30 pm - 8.30 pm. Round Foundry Media Centre, Foundry Street, Leeds, LS11 5QP. Your chance to talk to experts including Una Johnston (SXSW) and Phil Patterson (UKT&I Music Industry Specialist). Brought to you in partnership with UKT&I with the support of Screen Yorkshire. Want to showcase at SXSW 2010? Hoping to attend SXSW 2010? Following on from our activities at SXSW Music and Media Conference, Austin, Texas (March 2009), we are delighted to announce we have booked SXSW to come to talk to you! FIRST EVER Yorkshire music showcase at SXSW FESTIVAL, TEXAS. Featuring: Wild Beasts, Paul Marshall, Talk To Angels, Rolo Tomassi and Sky Larkin. Showcasing some of the very best talent from Yorkshire, England! RSVP at www.britishguestlist.info Priority will be given to badge holders. Great to see so many Yorkshire acts and music businesses going out to SXSW. Its a bumper year. If you are heading out this year make sure you check out Yorkshire acts KAISER CHIEFS, TODDLA-T, ASKING ALEXANDRIA, THE CHEVIN, THE VIOLET MAY, PAUL WOOLFORD, THE WEDDING PRESENT, SCARS ON 45, THE DUNWELLS + also BENJAMIN FRANCIS LEFTWICH, SLOW CLUBand SPECTRALS who we featured on previous Cds / showcases. We should claim ED SHEERAN too as he's originally from Halifax and we've just learnt that two local singer songwriters Jasmine Kennedy and Emily Sargent are now off to Texas too! Deadline for Canadian Music Week is today. Check it out here. Yorkshire bands! Apply to PRSF's British Music Abroad Scheme by 2nd December here. For Yorkshire music companies going to SXSW: UKT&I have a support package and funding available. Funding and also mentoring from Carlo Cavagna (Los Angeles) and Phil Patterson (London). Contact Jo Hubbard email: j.hubbard@uktiyorkshire.co.uk. Yorkshire bands, apply for your official SXSW showcases here. Also check back at musicyorkshire.com regularly regarding specific Yorkshire showcases, the CD etc. Rest assured that we are working hard to keep the Yorkshire project going. More news soon. Some great photos coming in from our SXSW showcase at the British Music Embassy click here! Lots of great feedback coming in from the Yorkshire & NE SXSW Party. Dinosaur Pile-Up are "Best SXSW discovery" in Spin magazine here There's an excellent Pulled Apart By Horses live review: here and David Thomas Broughton was Mojo Magazine's "pick of the day"
19/03/11 YORKSHIRE TOOK OVER SXSW !! Wow! British Music Embassy was full to capacity and all the acts played amazing sets at the Yorkshire & NE SXSW Party. Pulled Apart By Horses, Dinosaur Pile-Up, David Thomas Broughton plus North East bands Little Comets, Viva City ... You did us proud! Hope you get some great opportunities from this one! Pulled Apart By Horses and Tigers That Talked smashed it last night. Great to see this evening's Yorkshire Evening Post article and interview on BBC West Yorkshire Introducing. Off to see New Mastersounds, Asking Alexandria and Bear Driver tonight. Lots of promo out for the Yorkshire and North East Showcase on Saturday and the Yorkshire CD is being snapped up via the Brits Stand. All in all a freakin Yorkshire takeover! Tracks on this year's CD and the digital dropcard are ace. If you are heading out to SXSW, make sure you pick one up from the venue or from the stand. This year's lucky artistes are: Pulled Apart By Horses, Dinosaur Pile-Up, David Thomas Broughton, Bear Driver, Juice, Rolo Tomassi, Tigers That Talked, Alvarez Kings, Threads Orchestra, Benjamin Francis Leftwich, Spectrals, Shake Aletti, Napoleon IIIrd, Black Diamond Bay, Tom Staar, Submotion Orchestra, Vessels, The Beaus, End Of Level Baddie, Let’s Buy Happiness, Emily Portman, We Are Knuckle Dragger, Waskerley Way, Nadine Shah, Mammal Club, Viva City, Little Comets ... check it out here! Yes lots of Animal names playing SXSW 2011! Tigers That Talked, Bear Driver, Dinosaur Pile-Up and Pulled Apart By Horses! Is this a Leeds thing? Its not just this year either. We've had Lone Wolf and Wild Beasts play back in 2009. Sky Lark(in) too! Read all about it here! One of this year's sponsors "Plugged In" has organised a tasty music biz event called Music Futures. Read all about it here! Our Yorkshire and North East SXSW Party on the 19th March is part of a special Northern Day at the British Music Embassy venue. Read all about it here! Pretty busy getting the word out about the SXSW showcase, the SXSW CD etc. A few plugs coming in now. Check out Leeds Music Scene and Sheffield Scenester Please help us spread the word! 20/01/11 YORKSHIRE AND NORTH EAST SXSW PARTY 2011! In this era of cuts we just couldn't raise enough funding for the third Yorkshire SXSW Party but we (Timeless Music Project) have joined forces with Generator to establish a massive joint YORKSHIRE & NORTH EAST SHOWCASE event for SXSW 2011. Once more it will take place at the British Music Embassy venue, Austin on Saturday March 19th, 12 - 3 pm and promises to be an amazing showcase! More details soon. Amazing to hear that SO MANY YORKSHIRE ACTS have already been offered SXSW 2011 showcases. A bumper crop. We really do have the best UK music scene right now. More news on Yorkshire at SXSW in the New Year. Happy Christmas! 05/04/10 MORE PRESS: YORKSHIRE - THE HOTTEST SCENE AT SXSW? 19/03/10 YORKSHIRE SXSW PARTY - PACKED! It may have been an early kick off but Middleman, Slow Club, The Crookes, Grammatics and One Night Only played to packed music industry crowds at the British Music Embassy! Well done to all the bands for top performances and great vibes! 18/03/10 YORKSHIRE SXSW PARTY! TODAY! 17/02/10 YORKSHIRE SXSW PARTY 2010! Thursday 18th March 12-3 pm @ British Music Embassy venue features One Night Only, Pulled Apart By Horses, Slow Club and Middleman! Working hard to raise the necessary funding and sponsorship needed to ensure we have another quality Yorkshire presence at SXSW in 2010. Good to see that so many Yorkshire acts applied for showcases this year! Thanks to the venue, screen yorkshire, the panelists and the large crowd of delegates who turned up. We hope it leads to a Yorkshire invasion at SXSW 2010! 20/08/09 ATTENTION ALL BANDS, MANAGERS, LABELS - SXSW COMING TO LEEDS 15TH SEPTEMBER! Great to see the Yorkshire CD snapped up by Japanese Music Industry at the SummerSonic and British Embassy bashes in Tokyo! This is great. Steve Lamacq and Alan Raw are talking about the Yorkshire cd AND the showcase gig on BBC Radio 6. Ace. They even plug this website. Thanks guys! Huge relief. We can safely say that Yorkshire made an impact at SXSW 2009! A few photos from the FIRST EVER Yorkshire Showcase at SXSW. 20/03/09 Getting psyched! The gig is tomorrow. Doors 11.30 am!! The promo for our gig is out there. Seen the adverts now, got rid of most of the flyers and handed out a tonne of CDs ... As usual there is a serious amount of competition here. 100s of gigs on all at the same time! Fingers crossed. We've already made it to excellent sets from Yorkshire acts Slow Club, Ralph Lawson's 2020 Soundsystem, Stoney and Little Boots. Yes Little Boots. Come on, play fair ... we claim her! She's from Leeds dammit. 06/03/09 Greetings from pudding land! A bit of background info if you’ve never heard of it. SXSW is one of the largest music festivals in the United States, with more than 1,400 performers from around the world playing on over eighty stages in downtown Austin, Texas over four days in March. By day, conference registrants do business in the SXSW Trade Show in the Austin Convention Center and partake of a full agenda of informative, provocative panel discussions featuring hundreds of speakers of international stature. Running about trying to find Yorkshire pudding recipes that Americans might understand and tekkin tha whippet out for a few last walks down t’ginnel before crossing ova tha pond. Let’s be ‘avin’ yer! It’s tahm fer a rub-a-dub-dub! So don’t be shy come down to Latitude 30 on the Saturday. Get there early at 11.30am and make sure you pick up a copy of Independent Sounds of Yorkshire and the Humber 2009. We might even throw in some curd tart and a pickled egg! Talking problems out with a friend or family member can help put things in proper perspective. viagra online . 4 B and Fig. buy viagra . Cholinergic nerves may contribute to the erectile process through adrenergic inhibition as well as by causing release of nitric oxide from the endothelium. In light of these results and to verify that MDSCs are the target of sildenafil-mediated antitumor activity, we examined the effect of antibody-mediated MDSC depletion in combination with PDE5 inhibition in vivo. In Fig. ) Neurogenic Disorders (spinal cord and brain injuries, nerve disorders such as Parkinson's disease, Alzheimer's disease, multiple sclerosis, and stroke. Drew Pardoll, Elizabeth Jaffee, Katie Whartenby, Eduardo Sotomayor, Alessia Zoso, and Stephanie Mgebroff for their critical reading of the manuscript and Dr. Larry Lipshultz, chief of male reproductive medicine at Baylor College of Medicine in Houston. These imbalances can be the result of a tumor of the pituitary gland, kidney disease, liver disease, or hormonal treatment of prostate cancer. So it may not be surprising that it is estimated that ED affects approximately 31 million men in the United States, and as a whole, there may be as many as 300 million men around the world suffering with ED. viagra without prescription . viagra online without prescription . Alternatively, the sildenafil-mediated immune response against the self tumor-associated antigen can predominantly involve low affinity CD8+ T cells incapable of complete tumor cell killing. viagra online .